Can sub-units within a capitalist democracy, even a relatively decentralized one like Canada, pursue fundamentally different social and economic policies? Is their ability to do so less now than it was before the advent of globalization? 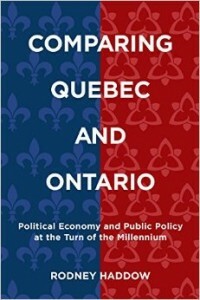 In Comparing Quebec and Ontario, Rodney Haddow brings these questions and the tools of comparative political economy to bear on the growing public policy divide between Ontario and Quebec. Combining narrative case studies with rigorous quantitative analysis, Haddow analyses how budgeting, economic development, social assistance, and child care policies differ between the two provinces. The cause of the divide, he argues, are underlying differences between their political economic institutions. An important contribution to ongoing debates about globalization’s “golden straightjacket,”Comparing Quebec and Ontario is an essential resource for understanding Canadian political economy.